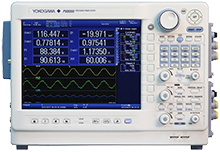 The PX8000 is the world's first precision power scope, bringing oscilloscope-style time-based measurement to the world of power analyzers. With up to four channels, it can perform standard multi-phase power measurements. These measurements exist alongside oscilloscope-specific features such as cursor-based specific time period measurements to enable analysis of waveforms with transient components. The PX8000 has a number of innovative features that support the crucial measurement and analysis of transient power profiles. Simultaneous power calculation Provides simultaneous voltage and current multiplication to give real-time power sampling. Cycle-by-cycle power trend measurement Trend measurements between waveforms can be calculated by mathematical functions (up to four million points). Specific time-period measurement Supports the capture of power parameters over specific periods of time through the definition of start and stop "cursors". Specified time-period waveform measurement Supports the capture of waveform parameters over specific periods of time through the definition of start and stop "cursors". X-Y display and phase analysis Supports X-Y axis displays as standard. It can also display lissajous waveforms of input and output for phase analysis. Capturing sudden or irregular phenomena An always-active History function automatically records up to 1,000 historical waveforms. Long-period data capture and analysis An accompanying PC application called PowerViewerPlus can be used to capture waveform data for further analysis. FFT analysis Features arithmetical, time-shift, FFT and other computations that enable users to display waveforms with offsets and skew corrections. Simultaneous harmonic measurement Makes it possible to simultaneously measure the harmonic components of voltage and current waves as well as the harmonic distortion factor. Multifunction snapshots Up to 16 different waveforms- including voltage, current and power, can be displayed side-by-side, giving engineers instant snapshots of performance. Detailed transient analysis Supports the measurement of all power waveform parameters between precisely defined start and stop cursors. Trend calculation Built-in functions for the direct calculation of variables, such as root mean square (RMS) and mean power values, to enable the identification of cycle-by-cycle trends. De-skew compensation Automatic de-skewing function eliminates offsets between current and voltage signals that may be caused by sensor or input characteristics. Powered by isoPRO technology Offers industry-leading isolation performance at the highest speeds. Delivers the performance needed to develop high-efficiency inverters that operate at high voltages, large currents, and high frequency.